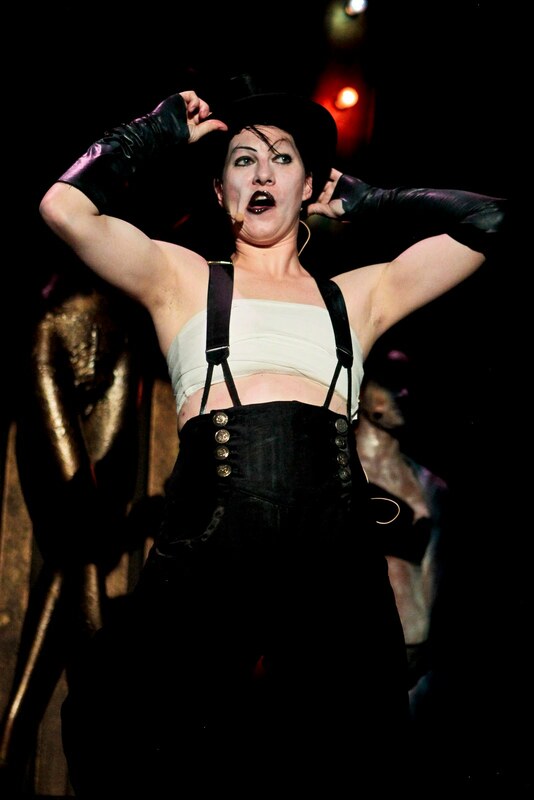 Dresden Dolls' Amanda Palmer, as the Emcee in Cabaret, currently running at A.R.T. in Cambridge, MA. More photos, info, and video here. Having heard the Dresden Dolls via MP3, I can see (just barely) how this idea has potential. Wish I could hop a train to Boston and find out how well it works. This brings me back to an article posted here recently about Diana Paulus' leadership at ART. I'm guessing Cabaret (w/ a semi-celeb) feeds the flame of those who think she is leading the co astray. If anything, looking at the upcoming season, the real worry might be that most of the shows spring from a very similar aesthetic. I actually think this is fabulous casting. While I've not seen Amanda live, I imagine this is right up her alley, and she'd really sell the part. But as to Matt's comment... I don't think she/The Dresden Dolls are at all well known enough for this to be considered "star casting." I'd just chock it up to clever casting, and it makes me want to take a trip to ART to see what it's all about. I saw this performance. I'm amazed at the sincerity of everyone's performance, including (especially) Amanda Palmer.